Building Powerful Turns & Jumps. All Levels. All Regions DVD. 103 minutes. 21 center exercises. 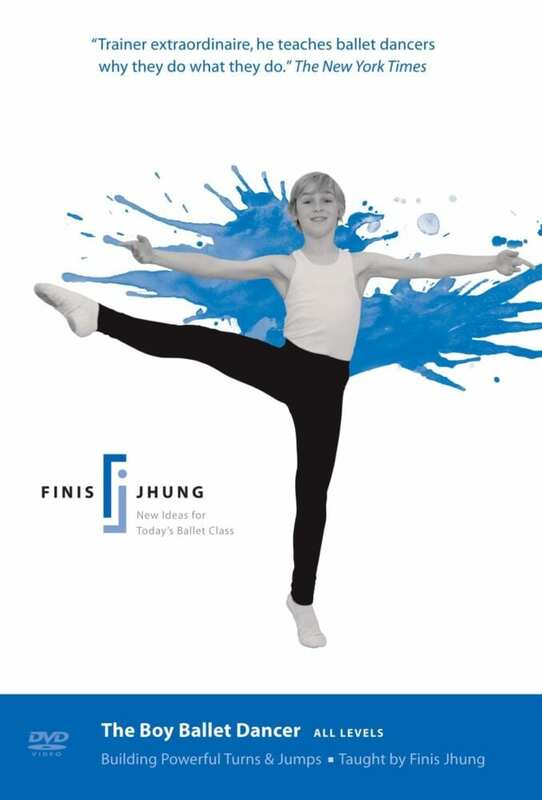 Based on his experience as the Trainer at Billy Camp and ballet teacher for the boys who played Billy Elliot on Broadway and on tour, Finis Jhung knows that today’s boy ballet dancer needs updated training—he must go beyond positions and poses and learn the mechanics of movement so that he can quickly nail those all-important turns and jumps. In this new video, 11-year-old Joseph Harrington—newly-cast as Billy Elliot—warms up standing alone in center floor so he can check his placement and form in the mirror. He then demonstrates the essential exercises which emphasize the spring action of the plié for powerful jumps, turns and combinations. Finis explains the exercise, Joseph demonstrates, Finis analyzes and Joseph repeats. At the end, Joseph performs jumps and turns that will make you stand and cheer as audiences do at Billy Elliot: The Musical. The CD music is by Scott Killian. “This video is a warm and conversational approach to building the strength and technique necessary to be an excellent male dancer. Nothing is omitted. Jhung teaches not only what the body should be doing and why, but also what the dancer should be thinking. “Feel the light on your chest, ears up and back, keep the energy turning and working out, balance with your entire body,” he encourages throughout. Eleven year old Joseph Harringon, newly cast as Billy Elliot, has been studying with Jhung for a year now and carries each exercise out with grace, ability and joy. A cherubic, long-legged young man, he listens attentively to Jhung’s every word. As the exercises become more challenging, Jhung analyzes and corrects, then Joseph repeats. They work without a barre so Joseph may better understand what the muscles are doing and where the weight is, directly in front of the camera as if it were the mirror. For the detailed tendu footwork required to build strong feet, the camera moves in close.